Pick over and wash spinach thoroughly. Add salt and cook until tender. Chop the spinach very fine. Melt 1 tablespoon. butter in a saucepan, add 2 tsp flour and blend. Slowly add 3/4 cup milk and stir constantly until mixture thickens. Combine with the chopped spinach, add pepper, nutmeg and serve. Cut into enough thin slices to measure about 4 cups. Heat butter in 2-quart saucepan over medium heat. Cook onion in margarine about 2 minutes, stirring occasionally. Cook, stirring constantly, until bubbly. Remove from heat. Stir in milk and 1-1/2 cups of the cheese. Heat to boiling, stirring constantly. Boil and stir 1 minute. Spread potatoes in ungreased 1-1/2-quart casserole. Pour cheese sauce over potatoes. Bake uncovered 1 hour. Mix remaining cheese and the bread crumbs. Sprinkle over potatoes; sprinkle with paprika. In large, heavy pan, or Wok, if you have one, heat oil, medium heat. Add carrots, garlic, onions, and ginger powder. Cook, stirring, a few minutes. Add rice, add some Soy/Teriyaki. Cook a few minutes, constantly stirring. Push rice to side of pan, make a well in center and add eggs, scramble, the incorporate into rice. Add the rest of the Soy/Teriyaki. Viola, tastes just like the Japanese Steak houses. Slice onion into quarters, then peel apart. Slice Squashes diagonally 1/8 inch pieces. Put ingredients on baking sheet in 350 oven. Bake one hour. Every 15 minutes take spatula and flip over. This is so good the main dish takes a back seat. Notes: If you wish to have a stronger curry flavor, add curry powder to the boiling water for the rice. It will make the rice yellow. Use chilled rice. Toast almond slivers in oven, set aside to cool. Mix all ingredients, adjusting depending on your taste for curry and vinegar. Add more or less mayonnaise to taste. If rice is too sticky and you wish to have a smoother consistency, add milk instead of more mayonnaise, if you're counting calories, otherwise add more mayo. Add almonds last, then chill well before serving. Blend in salt, pepper and cornflake crumbs or matzo meal. Heat about 1/2 inch oil in a large skillet. Add batter by the spoonful and flatten with back of spoon. Cook until crisp, 2 to 3 minutes. Turn and cook on the other side. Drain pancakes on rack or paper towels as they are ready. If you need to add more oil to pan, add it between batches. Serve hot with sour cream and applesauce. Drain off juice from potatoes and mash. Add margarine, granulated sugar, eggs, evaporated milk, and vanilla to the sweet potatoes. Place in a greased pan or casserole dish. Mix topping ingredients together and spread on top of the sweet potatoes. Bake at 350 degrees for 25-30 minutes. Rich and easy to make. A family favorite. In a large mixing bowl add cream of mushroom soup, milk, and cooled melted butter, stir and combine until smooth. Add the drained green beans and toasted almonds. Now add green beans and combine. Pour into a casserole dish, top with french fried onions, bake for 30 minutes at 350 or until bubbly and onions on top are slightly browned. 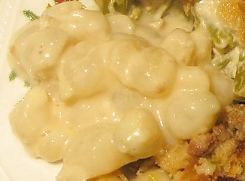 ...is just as it sounds, cooked, pearl onions, smothered in a creamy white sauce with a hint of nutmeg. Creamed Onions is a PIA to make. However, my husband loves this side dish, as his Mom always made it for Thanksgiving, because his Dad loved it, so the tradition continues! Notes: I always use 2% milk to create cream sauces, just to cut down on some unnecessary fat. It still tastes creamy and delicious. I make this dish the day before Thanksgiving because it takes a long time to prepare the onions, and remove the skins. The onions need to be blanched first and then the little buggers will "pop out" of their skins. Start a large pot of water, after the water boils, add the onions and boil for 1 minute, 30 seconds. Drain in sink over colander, with cold water running on them. Transfer to a large bowl of ice water and let sit for a few minutes. Drain cooled onions. Start a pot of salted water, when boiling, add the onions, turn heat down to medium low, cook until onions are tender or to your taste, 15-20 minutes. (My husband prefers a little crunch as opposed to too tender, overdone or mushy, so I slightly undercook the onions.) When done cooking, drain and set aside. Melt 2 tablespoons butter in a small saucepan over medium heat, add flour, stirring with a wood spoon for about one minute. Add milk (or cream) stirring quickly in small circles to make sure no lumps appear. (Or you could use a whisk.) Bring to a simmer while stirring/whisking. Simmer for a few minutes while sauce thickens. Add white pepper and nutmeg, salt and pour sauce over onions. The dish is ready to be eaten, serve and Enjoy! Note: If this is for Thanksgiving and you need to time and serve a lot of dishes hot, you could pre-make this dish and heat it up in oven in a casserole dish. Cover with aluminum foil.